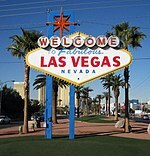 Las Vegas is the most populous city in the state of Nevada, United States. The city was founded in the first decade of the 20th century, and is a major vacation, shopping, and gaming destination. The city bills itself as The Entertainment Capital of the World, and is famous for its casino resorts and associated entertainment. Las Vegas is the 28th-most populous city in the United States, with an estimated population by the U.S. Census Bureau of 583,756 as of 2010. The Las Vegas metropolitan area, which includes Las Vegas, Henderson, North Las Vegas and the unincorporated valley has an estimated population of 1,951,269 according to the 2010 U.S. Census. The Young Electric Sign Company (YESCO) is the oldest and largest producer of electric signs in Las Vegas, Nevada. Along with competitors Ad-Art, Inc., FederalSign, Heath and Co. and Sign Systems Inc., YESCO has designed and produced many of the neon, incandescent, fluorescent and, more recently, digital signs which have helped define the Las Vegas Strip. Sam Boyd (April 23, 1910-1993), born in Enid, Oklahoma, arrived in Las Vegas, Nevada in 1941 with only $80 in his pocket. He was able to work his way up through the gaming industry by first working as a dealer, then as a pit boss, and as a shift supervisor. Eventually he saved enough money to buy an interest in the Sahara Hotel. Add a few topics to the Las Vegas Topics section, perhaps links to wikinews?